The Lone Oak Lodge is renowned for providing a family atmosphere featuring a wide variety of guest accommodations ranging from family cottages with kitchens, double rooms, single rooms, and suites fitted a hot tub and fireplace. Our cozy rooms, suites, and cottages offer value and comfort with a nod to days past with our traditional American style motor lodge accommodations. We provide cottages that feel more like a cozy apartment that include full eat-in kitchens, and multi-room cottages and guest suites that are ideal for families. Many of our guest accommodations include an electric fireplace to keep cozy during the evenings, and all guest rooms, suites, and cottages include modern conveniences like complimentary WiFi and flat-screen TVs. Outdoor corridors provide easy access to guest rooms, and guests can park directly in front of their rooms. We look forward to hosting you as our guest at the Lone Oak Lodge where family-friendly traditional motor lodge accommodations converge with modern comforts to create an ideal stay in one of the most beautiful locations on the planet – Monterey California. We have a 7-day Cancellation Policy. If you wish to cancel or modify a reservation, you must do so by 1 PM 7-days or 1 week prior to your arrival date. We have a 30-day cancellation policy for special events and holidays. If you cancel or modify post the expiration of the Cancellation Period or you fail to show up, a no-show charge will be levied on your credit card for one full night. If you made your reservation via a 3rd party booking service (Expedia, Booking.com, etc. ), you MUST contact them directly to modify or cancel your reservation. We cannot honor any request to modify/cancel 3rd party bookings. FOR MODIFICATIONS, PLEASE MAKE SURE THE ROOM AND DATES ARE AVAILABLE BEFORE SUBMITTING YOUR REQUEST. On the day of travel, click on the late arrival tab and enter your information. After we receive your information, we will check you in using the valid credit that we have on file, and we will assign a lockbox. After we check you in, we will send you an email with your lockbox code and room number. When you arrive at the hotel, pull in and go to the back of the office where there is a white picket fence. Our lock boxes are on the wall beside the office back door. Enter your code to access your room key. Then, enjoy your stay! 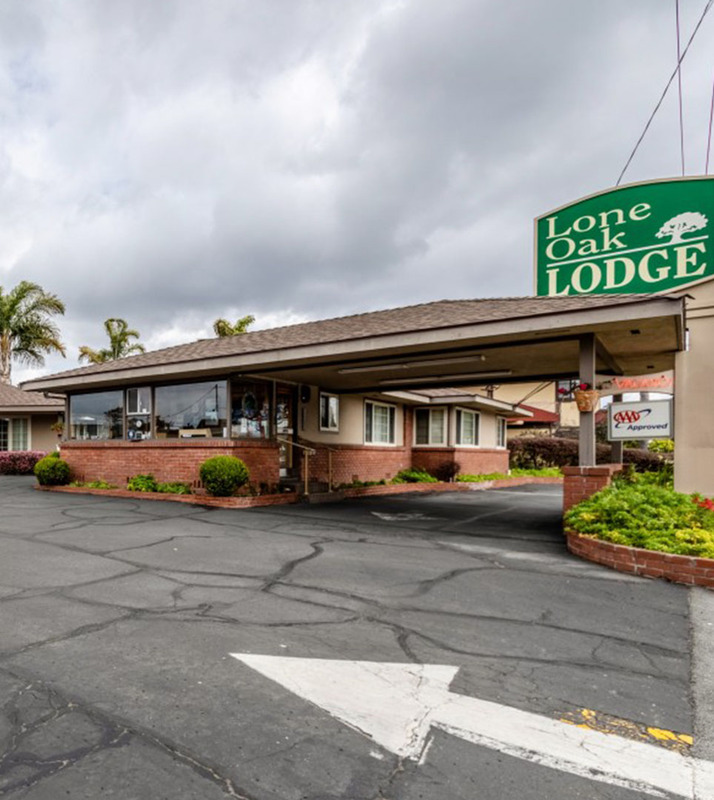 Guests will find the Lone Oak Lodge at 2221 N. Fremont Street in the heart of Monterey California. Our Fremont Street address keeps guests within minutes to Monterey’s top attractions while offering a quiet respite from a day of sightseeing. Public transportation can be found directly in front of our American style motor lodge, and we are within walking distance to popular area restaurants. We provide our guests with special touches to ensure guest comfort like complimentary WiFi, complimentary self-parking, refrigerators, microwaves, late check-in, barbecue grills, fire pits, and a diver rinse off area. We also have 350 square foot of conference and business center space that accommodates up to 15 people, an indoor Jacuzzi room with a dry sauna, and exercise equipment. Complimentary self-parking is available for guests. Children 12 and younger stay for free. Pricing is based on two guest minimum. If more than two guests occupy select rooms, a fee of USD 15 will be assessed per additional person age 13 and older-per night. There is no capacity for extra beds. ADA Defined Service Animals are welcome at our hotel. Absolutely no pets are allowed. This property is privately owned, and the management reserves the right to refuse service to anyone and will not be responsible for accidents or injury to guests or for loss of money, jewelry or valuables of any kind. Once checked in, no cancellations. All linens are inventoried: missing or damaged linens will be charged. Any damages to hotel property will be charged an additional fee upon assessment. NO PETS ALLOWED. Guest rooms that have evidence of pet dander and/or odor will be charged a $150 non-refundable fee for deep cleaning services. Any damages to hotel property will be charged an additional fee upon assessment. This is a NON-SMOKING facility. Guest acknowledges that smoking is not allowed in the guest room or within hotel facility. If anyone in guest's party smokes in the guest room, guest hereby expressly authorizes hotel management to charge credit card the amount to reimburse the property for the additional cost of cleaning guest room. If your reservation has been paid in advance or you elect to pay by cash, a security deposit via credit card will be required upon check-in and will be charged in the event that damages outlined herein occur. A valid photo ID and credit card are both required at check-in. Hotel takes a credit preauthorization but does not accept cash deposits.